Remote Keyboard for Control of All MIDI Synthesizers. 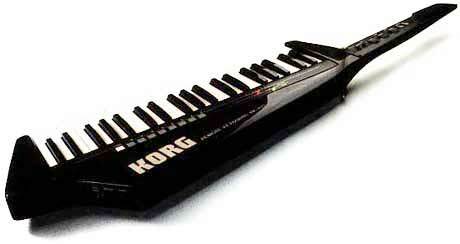 The strikingly styled RK-100 is a 41-key remote shoulder keyboard that can be used to play any MIDI equipped synthesizer such as the Korg DW-6000, Poly-800 or EX-800. A single MIDI cable carries all the data needed to control synth. That includeskey (pitch) data, program select, pitch bend, modulation (wah wah and vibrato),and volume control. So you can change program numbers, add effects,and adjust volume while playing and moving about on stage. The lockable DIN connector and active sensing reduce the chance of disconnection problems. Well balanced and comfortable to wear, the RK-100 will add action to your keyboard performances. Available in red, black, white, or walnut colored finish.